I’ve been really lucky to have been able to use Shotgun as a developer for some time now (getting to know the API, integrating it into 3ds Max pipelines, etc…). Now, for the first time, I’ve actually tried to use it on a production we’re working on here at duber studio. The reason is the sheer amount of shots needed to be done, even though they are not very complicated. We’re currently working on a number of animated shots for a portable devices app to be released soon, first locally, then globally. It’s an app aimed at helping people with their fitness excercises. So, we have to animate a ton of shots of a main character doing various different excercises. Again, it’s not very complicated, but since I’m working with a collegue of mine on this project I also need a tool to manage the production. It actually surprised me how useful Shotgun is even for a team of just two people! It’s incredible how much time and effort you save when you don’t have to hassle around with Excel sheets and tons of e-mails. Further on, I’m currently integrating certain actions into Deadline, so that I can automate a ton of tasks on the production. 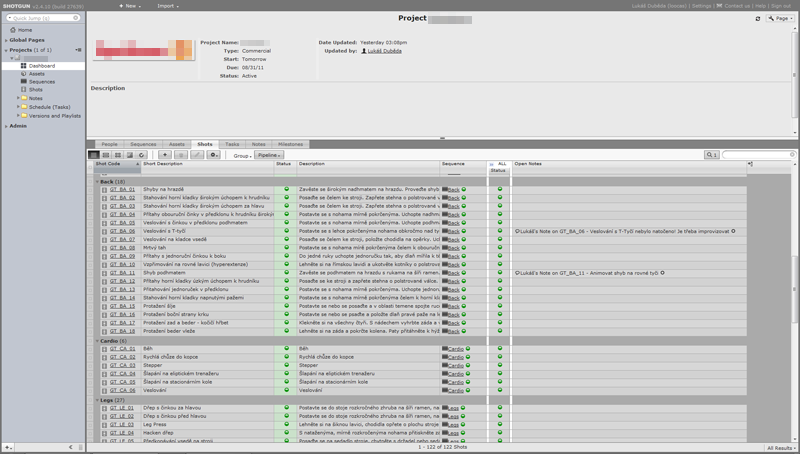 For example, I’ve setup Deadline so that when we submit the 3ds Max scene files, they get rendered, when they finish, Nuke automatically picks up with a pre-made automated comp (visually approved by the client) and then after that Deadline will process the frames again and will generate QuickTimes, delivery masters and preview JPEGs. While all these steps will get annotated in Shotgun. Pretty exciting stuff for a geeky TD, right? Anyways, I’m currently just looking into best ways of doing this effectively and as open as possible, so I can share the stuff with others as well. All in all, Shotgun seems to be one of the tools that you really need all the time, but you know you found the answer only after you’ve fully discovered its possibilities and potential. I highly recommend talking to the Shotgun dev guys in regards to a demo or trial. You won’t regret it. I certainly didn’t!